It has become clear in recent years that chronic inflammation is the cause of many devastating diseases including arthritis, heart disease, Alzheimer’s disease and cancer. Research has found that eating a diet high in anti inflammatory foods not only protects against disease, but speeds the metabolism and actually slows the aging process. Inflammation is the body’s healing response, which sends a signal to direct more blood, nourishment and immune response to an area of injury or infection. Chronic infection however, is destructive to the body and can lead to disease. Inflammation can come from many sources; toxins in the environment, sedentary lifestyle and lack of exercise, stress and emotional toxicity, genetics and most importantly, what we eat. Because the diet is so powerful when it comes to both harming and healing the body, below are some of the ways that we can all eat in a way that combats inflammation. Food therapy is a huge component of Chinese medicine, and what we eat is one of the easiest and most powerful ways that we can use to stay healthy now and long into the future. One way to use food as medicine is to make sure that we are eating food that is as fresh and chemical free as possible. That means eating organic whenever possible to avoid pesticides and unnatural genetically modified foods that our bodies are not designed to consume. It is always best to eat fresh, local foods that are minimally processed to get the most benefits for your mind and body. The following foods are some of the best for fighting inflammation. There are many ways to cook vegetables, but steaming is one of the best because it improves the availability of nutrients helping us to absorb more of them as well as allowing the mucosa in the GI tract to repair itself. Use minimal raw foods (which are considered “cold” in Chinese medicine) except for occasional salads in warmer months to help keep you cool. Vegetables provide important flavonoids and carotenoids which have antioxidant and anti inflammatory properties. Excellent vegetables for inflammation include eggplant, okra, onions, purple cabbage, broccoli, brussels sprouts and red peppers. You can add anti-inflammatory herbs and spices such as turmeric and ginger to make those veggies even more delicious and enhance their anti-inflammatory effect. Eat 5-6 servings a day minimum. One serving is equal to 2 cups of salad greens, 1/2 cup of cooked, raw or juiced veggies. You can eat one to two cups of whole grains per day. The best for inflammation are barley and oatmeal. Be sure to consume high amounts of fiber as it contains naturally occurring anti inflammatory phytonutrients. Other grains that are good for inflammation include basmati, brown or wild rice, millet, quinoa, amaranth, buckwheat and rye. Rice crackers and wasa crackers are another grain food that you can eat with spreads like guacamole and hummus (excellent anti inflammatory fats!). 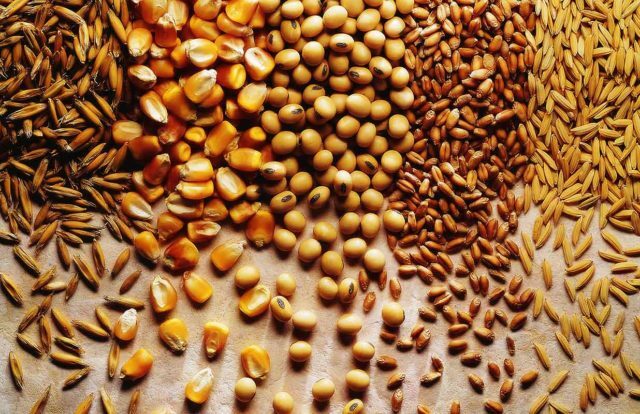 Grains digest slowly, keeping blood sugar levels stable thus helping to combat inflammation. 3-5 servings a day. One serving is equal to 1/2 cup cooked grains. Nuts and seeds are a great food as they are so portable. You can carry with you raw, unsalted almonds, sunflower seeds and pumpkin seeds. Flax and chia seeds are a great thing to add to smoothies or salads. Hazelnuts, macadamia nuts, cashews and walnuts are also packed with anti inflammatory properties. 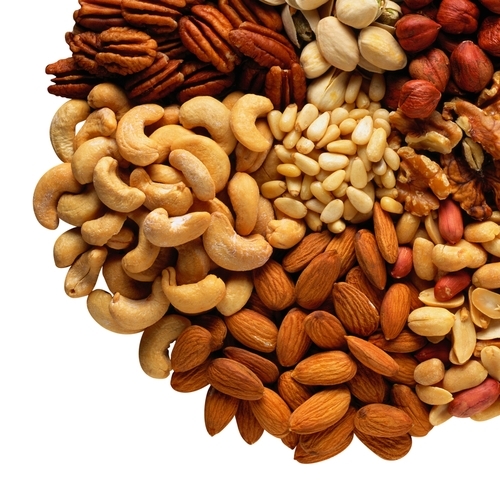 Nuts and seeds are whole foods, and really pack a punch when it comes to inflammation because they offer healthy fats, fiber, protein and vitamin E. Nuts and seeds contain either monounsaturated or omega-3 fats which help to reduce inflammation. 5-7 servings a day with one serving equal to 1 teaspoon of oil, or about 2 walnuts. 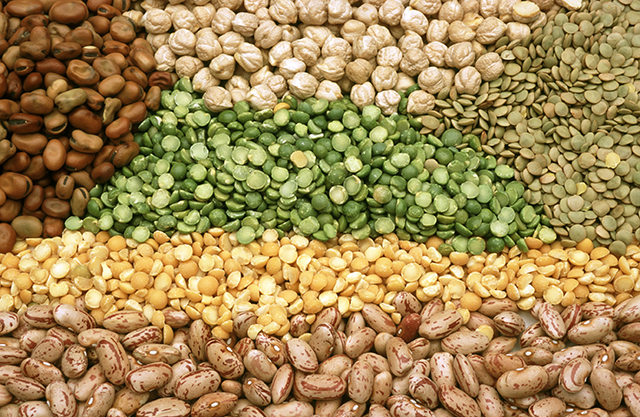 Split peas, lentils, pinto beans, mung beans, chick peas, black beans and adzuki beans are great for inflammation. They are packed with folic acid, magnesium and potassium as well as soluble fiber. They also have a low glycemic index which makes them great for anyone concerned about high blood sugar. Make sure to eat legumes well cooked, as they can be hard to digest. A good way to consume them is pureed in spreads like hummus. 1-2 servings per day with one serving being equal to 1/2 cup of cooked legumes. Because much of the earth’s lakes and oceans are now polluted, it is best to eat deep sea fish, and smaller fish with less time to accumulate toxins. Fresh caught fish is preferable to farmed fish. The best choices are salmon, halibut, black cod, herring, sardines and mackerel. Fish should be poached, baked, steamed or broiled. 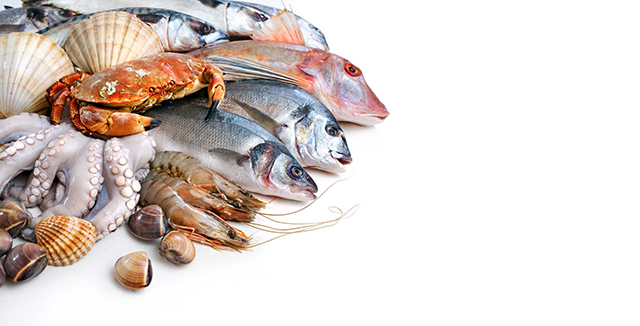 Fish contain omega 3 fats which are a powerful anti inflammatory for the entire body, and particularly the brain. Recent research has also proven that the omega 3 fats in fish oils can protect the elderly brain, with the ability to maintain optimal brain function for longer than for people who don’t eat fish or supplement with omega 3 fats. You want to have between 2-6 servings per week, with one serving being equal to 4 ounces. Most people eat a diet high in animal foods, which can lead to health issues. Remember moderation in all things! Meats also, because of the huge demand and factory farming contain hormones and other drugs that you are also consuming when you eat the animal. Another thing to consider, and Chinese medicine believes this, is if the animal is raised in terrible conditions and has lived an unhappy life, you are eating that energy as well. Best to reduce animal products, and choose grass fed, organic meats from happy animals. If you are lucky enough to live near a farm where you can develop a relationship with the farmer and ensure that the animals are both healthy and happy, all the better. For those of us who cannot, best to stick to grass fed, organic meats, and organic, cage free chickens and eggs. Remove skin from chicken and turkey (to avoid excess fats). 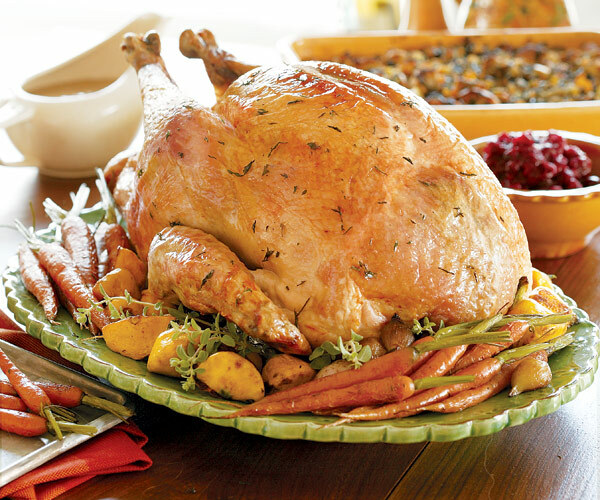 Chicken and turkey should be baked, broiled or steamed. 1-2 servings per week, one serving being equal to 3 ounces of cooked chicken or turkey. Fruits are a wonderful source of antioxidants and are rich in flavonoids and carotenoids. Try to eat the rainbow with lots of variety while eating fruits that are in season, fresh if possible, or frozen. Always buy organic if possible as fruits tend to be grown using a lot of pesticides. Fruits yield a ton of health benefits as well as being highly anti inflammatory. 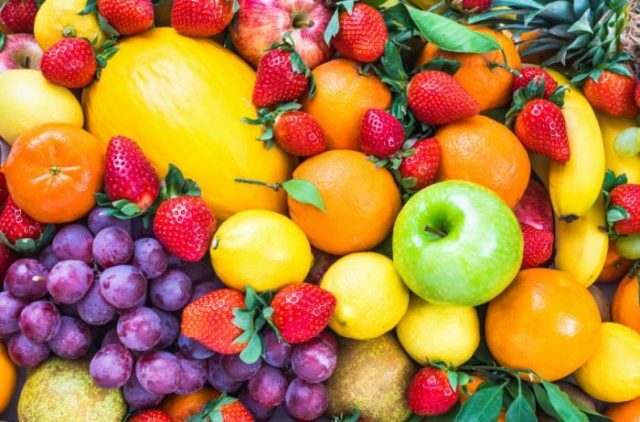 The best choices for their anti inflammatory properties are raspberries, blackberries, strawberries, nectarines, peaches, red grapes, pink grapefruit, pomegranates, plums, cherries, apples and pears. Eat 3-4 servings per day with one serving being equal to one medium sized piece of fruit. When using butter, try mixing one pound of butter with one cup of extra virgin olive oil. Whip it at room temperature and store in the refrigerator. This mix provides the benefits and taste of butter and the essential fats found in olive oil. When using oil for cooking, try to use extra virgin olive oil. On salads try organic, expeller pressed sunflower or safflower oils, as well as walnut and hazelnut oils for a different flavour. Try not to heat the oil, but add it after foods are already cooked. Extra virgin olive oil is rich in polyphenols and antioxidants. Spices add flavour to the foods we eat, and some spices are loaded with anti inflammatory properties like turmeric and ginger. Some others are curry (which includes turmeric), parsley, savory, cardamom, garlic, chili peppers, thyme, rosemary, basil and cinnamon. 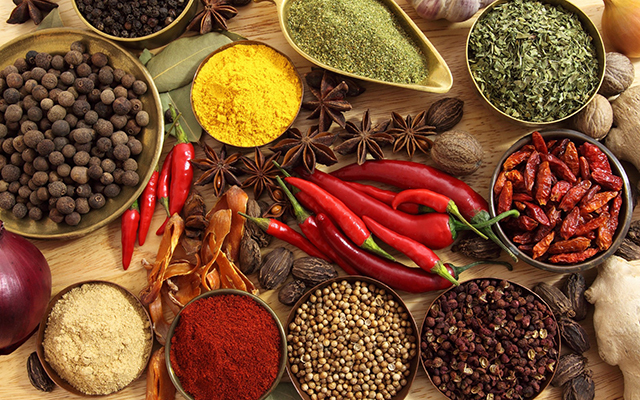 You may use unlimited amounts of spices to add to any dish. Be creative, the right combination makes any meal even more delicious! Everyone knows the importance of staying hydrated, so a minimum of 8 cups of clean, filtered (reverse osmosis filtered if possible) water a day is recommended to stay healthy and combat inflammation. Drink it at room temperature or warmed if you prefer, but do not add ice or drink it cold out of the fridge (this is very hard on your spleen!). A glass of lemon water in the morning is an excellent way to detox your body before you start your day. 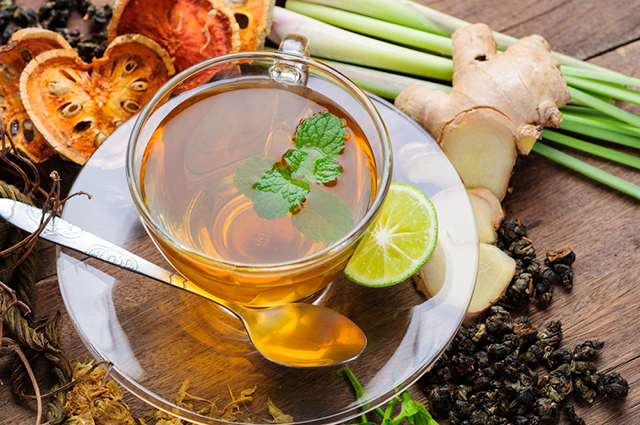 Drink herbal teas, preferably in the evening and sip them slowly. It is best not to drink with meals as it dilutes stomach acid and hinders efficient digesting. Tea is high in a compound called catechin, which reduces inflammation. Drink herbal teas 2-4 times per day. The best choices are high quality oolong, green and white teas. Research how to brew each type for maximum flavour and health benefits. Eating in a healthy, balanced way is one of the best and easiest ways that we can not only combat inflammation, but maintain overall health. Other factors like managing stress and regular exercise are important for avoiding inflammation. Chinese medicine says balance in all things which it seems is getting harder and harder to do with lives that are increasingly complex and hectic. Remember to chew food well and always take time to eat, trying to just focus on eating rather than doing many things at the same time. This is difficult in a culture that values multitasking, but being mindful and focussing on eating is a way that we can help the digestion to be more efficient and process our food more thoroughly. There are many foods you can add to your diet to reduce inflammation and stay healthy and happy, right now and well into the future. This a great article that breaks down each food category nicely. My one suggestion would be that while olive oil is amazing when used cold, it should really never be heated above a low/medium heat. This changes the molecular composition of the oil and actually turns it into a hydrogenated oil. Olive oil should really only be used for dressings and not for cooking. Unrefined coconut oil has a much higher heat tolerance and is also a very good option for an anti-inflammatory diet. Thank you for that bit of information. That is helpful to know. Nuts and grains should be sprouted for best absorption of their nutrients. When grains are spouted, the body regards them like vegetables rather than carbohydrates or starch, and thus there is less of a blood sugar spike, and less chance of inflammation. It’s said that the diabetes epidemic is due, in part, to the over-emphasis on starches in the US FDA food pyramid, as well as Americans’ tendency to consume nuts and grains that are not properly prepared, and thus, in-digestible. It’s a lot of information to take in! Great Share! Very helpful with lots of required information. The right food can help to reduce inflammation and improve overall health. Also, checkout the Dr. David Seaman website who work in the area of pain and inflammation has been cited by researchers at Harvard University, the CDC, and other universities in America and Abroad. To combat inflammation consider acquiring the Deflame Diet Book, Deflaming supplements from Anabolic Labs, and consider Deflame Consulting.